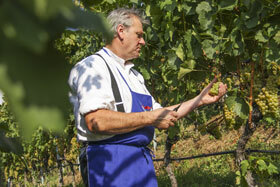 Innerperskoler farm is located in sunny Aicha di Fiè, surrounded by vineyards and chestnut groves. The altitude of 700m above sea level favours both viniculture and cattle farming. In 2014/15 the Prieth family, the current owners, established a farmhouse inn where local South Tyroleans and tourists alike are welcome to delight in the fruits of the harvest. 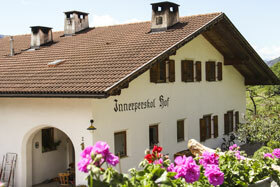 Innerperskoler farm was first mentioned in 1267, more accurate records date back to 1569. In 1736, a chapel was erected in order to bless and protect the farm and the house. It was dedicated to Saint Florian, the patron saint of chimney sweeps and firefighters, yet the farm and the barn burnt down entirely in 1994. Many precious documents and other objects were lost in the flames. The former owner Hermann Vieider rebuilt house and farm completely. We are looking forward to having you as a guest at our „Buschenschank“! At Innerperskolerhof, we invite you to taste many traditional South Tyrolean dishes such as barley and pumpkin soup, Schlutzkrapfen (a typical filled pasta dish), hearty salted meat and South Tyrolean dumplings of all kinds, accompanied by a glass of wine from our own vineyards. Autumn is the perfect season for hiking – starting from Presule or S. Catarina you will easily get to our farmhouse. Our inn is the perfect location for family reunions and festivities. 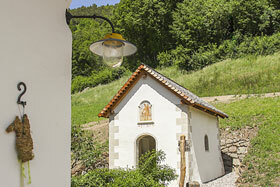 The recently refurbished chapel makes it a perfect spot for celebrating anniversaries. Törggelen at a farm inn in Völser Aicha - the South Tyrolean culinary tradition is popular with both guests and locals alike. Innerperskolerhof is located directly at the „Oachner Höfeweg“ farmhouse theme trail. You can conveniently get here by car via the Unteraicha access road.